Credit spreads are tightening but remain wider than the last two equity market tops. 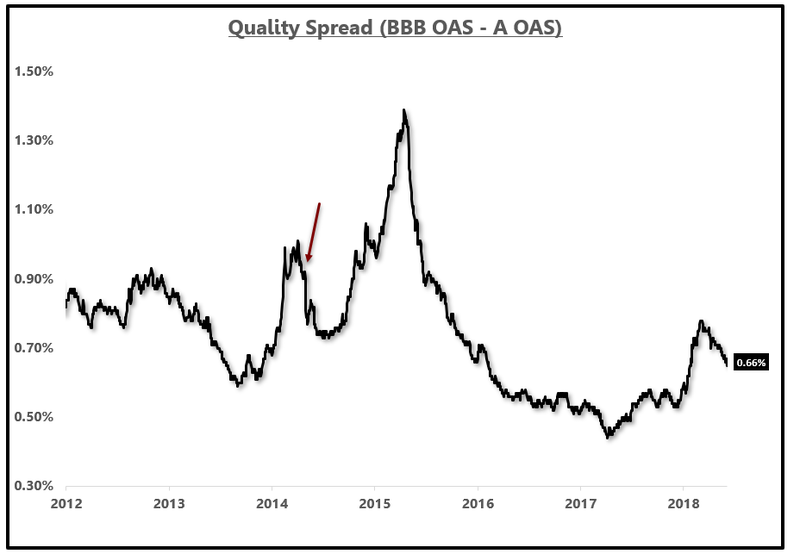 Quality spreads are not tightening like regular credit spreads. The potential for fallen angels is still a problem. Corporate bond spreads, or the difference in yield between a corporate bond and an equal maturity Treasury bond, measures the relative risk of owning various corporate bonds across the risk spectrum relative to the "risk-free" rate. As the yield spread between corporate bonds and Treasury bonds rises, this typically indicates increased levels of risk, worsening market or economic conditions or general health of corporations including debt levels and the ability to repay obligations. I have covered the BBB corporate bond bubble in the past which brought in an analysis from Bruce Richards of Marathon. For an analysis of the long-term issues in corporate debt, one of the many flashpoints this economic cycle, I suggest watching that interview. This analysis, or the fact that I am referencing this analysis, is not meant to be a "sell everything signal" nor is it an attempt to market a bearish narrative. The numbers in this analysis are quite real and while long-term issues can take years to materialize, these are potential flashpoints that are worth noting. When analyzing credit spreads, as I do at the end of every week, it is important to look at both credit spreads and quality spreads. Credit spreads, as mentioned above, measure the yield of a corporate bond above an equal maturity Treasury bond. Quality spreads, however, measure the yield differential between various areas of the credit spectrum in the corporate bond market. 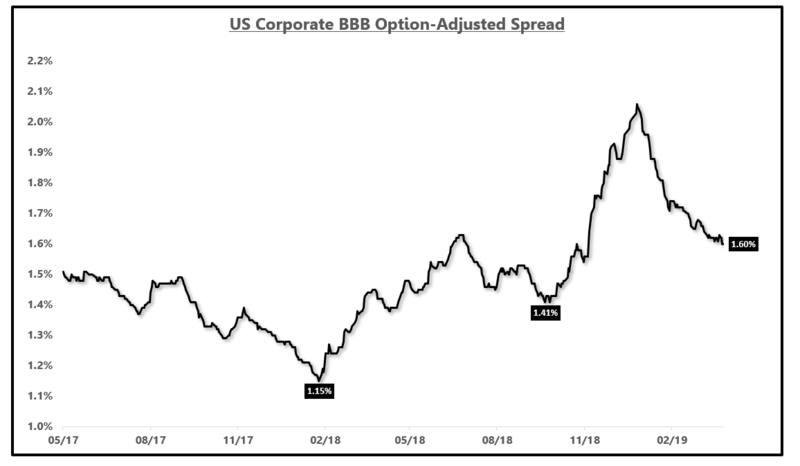 The reason it is important to measure both credit spreads and quality spreads is that in a general "risk-on" environment, all corporate bonds can rally in a "rising tide" fashion while the relative risk of a specific credit quality may not be changing much. For example, the issue today, as outlined by Bruce Richards and dozens of other analysts, is in the BBB-rated area. Some have suggested that BBB-rated bonds have rallied which means the risk has been reduced, but quality spreads are suggesting this is only partially true. If we look at the spread between BBB-rated bonds and Treasury bonds, or the BBB-rated Option-Adjusted Spread "OAS", we can see a marked improvement since the December high in spreads. In December, when recession fears were flaring, corporate bonds started to decline rapidly and BBB-rated paper was at the center of that fear. 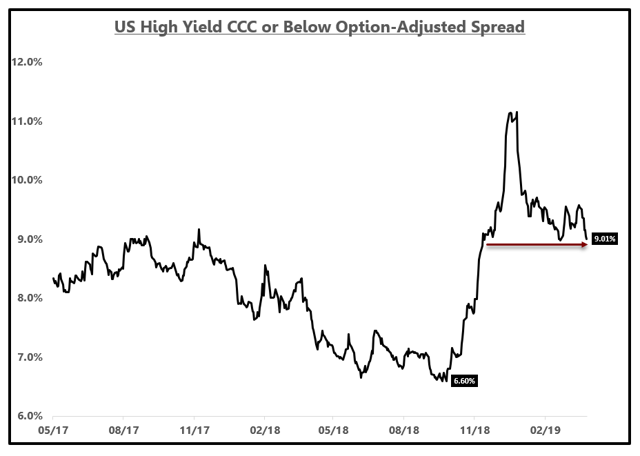 While it is important to note that credit spreads have come down since December, it is important to look back at the rate of change in spreads over the past year and other time frames as well. There is no question spreads have come down across the credit spectrum if we use December 2018 as our base, but spreads are still notably wider than January 2018 and October 2018, the last two times the equity market was near today's levels. We can, therefore, say that the equity market is making a run at a new all-time high with an elevated level of credit risk relative to the past two market peaks. Of course, this does not argue against the S&P 500 making a new all-time high, but it does suggest that the market may be in the process of making a new all-time high with an increased level of credit risk. If we move down the risk spectrum to CCC-rated corporate bonds, spreads have also come down notably but remain about 240 basis points above the October low. Moving back to BBB-rated bonds, we should now look at a quality spread that I have been tracking closely. 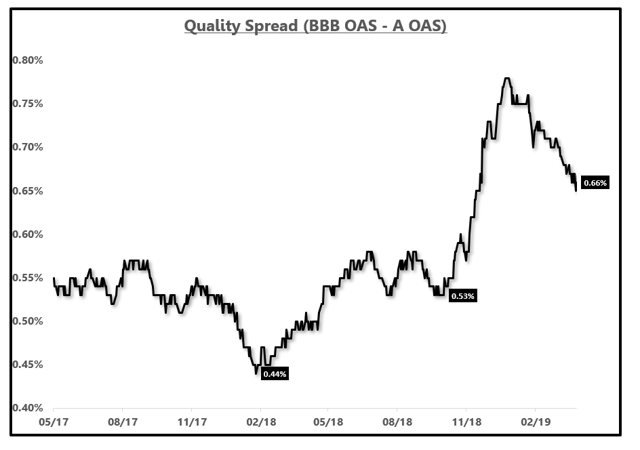 If we look at the spread between A-rated OAS and BBB-rated OAS, we can see the relative risk between A-rated corporate bonds and BBB-rated corporate bonds. These two credit qualities are just one rating apart. This spread also removes the "rising tide" effect that can push all corporate bonds higher in a "risk-on" environment. This particular quality spread widened two distinct times with the Q4 sell-off being particularly sharp. The relative risk in the BBB-rated space compared to A-rated corporate bonds remains elevated. Even if we pull the chart back, we can see the quality spread this cycle during other economic slowdowns such as 2015-2016. It is worth noting that there can be sharp counter-trend moves within a widening phase as I view the early 2015 move in spreads as part of the same widening event that coincided with the 2015-2016 economic slowdown. I also view the widening of spreads that began in early 2018 as one distinct widening event that coincides with the economic slowdown of 2018-2019. It is correct to say that the nominal level of the quality spread graphed above is quite low relative to history and that is a relevant point. As an economic cycle analyst, I concern myself with the rate of change in all economic data as opposed to the nominal level. In rate of change terms, we are still in a widening phase. Credit spreads are just one tool in the toolkit. Everyone should add quality spreads to their baskets of market data. It is important to note that credit spreads, quality spreads, equity prices, oil prices, etc. are all "market data". Market data is important and should be part of any comprehensive analysis of economic cycles when coupled with both "hard" and "soft" economic data. Many market participants have time frames that are relatively short and thus solely use market data. Strong economic cycle analysis seeks to identify economic inflection points that leads the market data when the charts look the best. Market data is best used in conjunction with hard and soft economic data to strengthen the conviction at economic cycle inflection points. The relative risk in the BBB space is still elevated. This should not be taken as a bearish alarm bell but it should highlight some of the risks that can get overshadowed by a risk-on rally that has been localized to market data. It is likely prudent to use this equity market rally to asses equity holdings for companies holding BBB ratings, especially if the leverage ratio of that BBB-rated company suggests a lower rating is more accurate. As economic cycles get deeper, strong balance sheets and high-quality companies tend to outperform.